Have Financial Markets Gone Post-Human? So, Thomson-Reuters pays the University of Michigan a million dollars a year to provide selected clients with the results of the latest survey of consumer sentiment 5 minutes before the rest of the world sees them — and to provide higher-paying clients with this information in a machine-readable format ready for algorithmic trading 2 seconds before the rest. 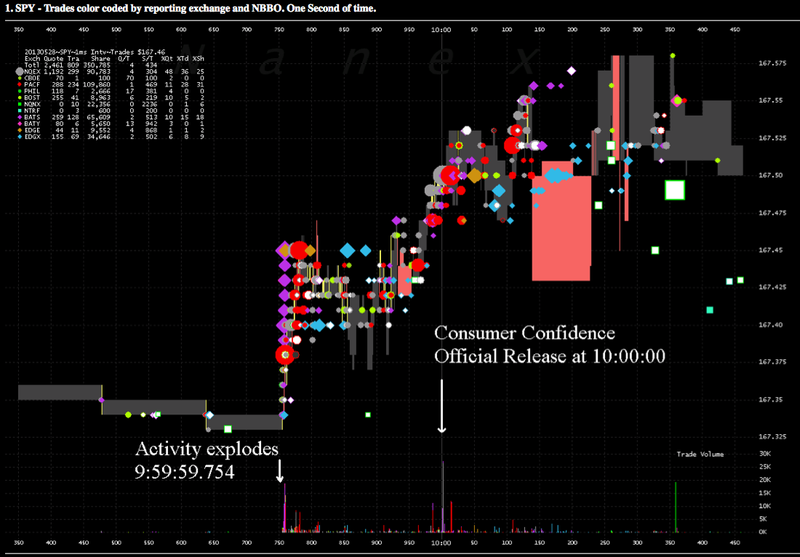 On May 28, 2013, about 1/4 second before the expected release of the Consumer Confidence number, trading exploded in SPY, the e Mini and hundreds of other stocks. Even more interesting, activity exploded just 1 millisecond earlier in the futures (traded in Chicago) than stocks (traded in NYC). The speed of light separates information between Chicago and NYC by at least 4 or 5 milliseconds. Which means this was more likely the result of a timed trading in both futures and stocks, rather than a arbitrage reaction between the two. We found no other instances of early trading in the 11 previous monthly releases of the same Consumer Confidence data. So, is having a two second jump on the market “insider trading”? Well, yes — but it’s legal insider trading with consent, out in the open. And it likely provides a valuable income stream for the University of Michigan. With or without an early information premium, the algorithmic traders would still have the jump on the wider market. A two second delay in the high-frequency world is an eternity. This kind of early information premium is more like a financial tax on high-frequency traders. If we’re going to have high-frequency trading at all, it may be better for publicly-funded information providers to be able to recoup some or all of their costs by charging the high-frequency traders. In fact, while high-frequency trading continues states might want to look at rolling this out across other datasets, and putting the proceeds toward infrastructure spending or some other public good. After all, while banning high-frequency trading makes for attractive rhetoric, it would probably send an even greater amount of financial activity offshore into a jurisdiction that allowed it. That implies that it would probably be about as effective as prohibiting marijuana and alcohol. And is this financial markets going post-human? These kinds of barriers to entry cannot be healthy for inclusive, open, transparent markets. If there was anything that might drive retail investors out of the markets — retail investors remain significantly under-invested on where they were before the advent of high-frequency trading, for example — it is massive information asymmetries that render the little guy entirely uncompetitive. Of course, retail investors can still be fundamental value investors, buying and holding. But trying to daytrade against the algorithms seems analogous to a human runner competing against a Ferrari. In fact, given the timeframes (microseconds, in some cases) this analogy is many orders of magnitude too small; it’s closer to a human runner competing against an Alcubierre warp drive. Not so much picking up nickels in front of a steamroller as picking up nickels in front of a Borg cube. If this continues, trading is going post-human. But in the long run — given how badly traders tend to do against the market — perhaps driving daytraders out of daytrading where they tend to lose money against the market, and into holding diversified index funds is a cloud with a silver lining. Let the robots read the tape (i.e. use regression analyses) and do financial battle. Robots are fast, they don’t get bored or discouraged. Just as in other areas where human endeavour is threatened by robots, it is important to note that while robots can do many things, there are many spheres where humans still have a great advantage. Let humans act in the roles in which they have a natural advantage, and in which robots do not have any skill at all — abstract thought, creativity, social interaction. Robots are still largely confined to drudgery; the word itself is rooted in the Czech word for drudgery, after all. In finance, while robots may some day soon do the overwhelming majority of the trading, humans can still devise the trading strategy, still devise the marketing and sales strategies, and still devise the broader macro strategy. So perhaps the beginning of the end for human traders is just the end of the beginning for global financial markets. Perhaps that is less of a death sentence, and more of a liberation, allowing talented human labour that in recent years has been channelled into unproductive and obscure projects in big finance to move into more productive domains. This entry was posted in Finance, Philosophy and tagged big finance, high frequency trading, insider trading, Nanex, picking up nickels in front of steamrollers, productivity, prohibition, robotics, the borg, the future. Bookmark the permalink. ← Why Does Anyone Think the Fed Will Taper? As has always been the case, the great majority of lying, cheating, stealing, fraud, and all the rest, has been perfectly legal. After all, isn’t the primary role of the legislative body to make this possible? In the case of “insider trading,” playing the stock markets are as moronic as are going to a billion dollar casino in Las Vegas and believing you are gong to win [in the long run]. Be it in Vegas or in Washington, regular people are duped by the idea that they, too [along with the leaders of all groups], can truly get something for nothing, despite reality staring them straight in the face. All group-sponsored activity is rigged, by definition, otherwise, why would they do it in the first place? Robota is Ukrainian for worker, so drudgery is apt too. How ironic. I laugh at the Trading ads you see on CNBC etc. It encourages “smart” “intellectual” types to pit their wits and make money using their “edge”. It is just as bad as ads targeting lower classes to play slot machines or Roulette. This is why I manage my own retirement fund. I buy and hold and trade after 1 year (Australian Tax advanatges) looking for trends. I am a contrarian investor, and realise that criminals push the market to extreme lows to “Shake the easy fruit from the tree”. Too many people have been burnt by the last market collapse, so they are extra timid. That is why Ben has to juice the market so hard, to overcome their timid souls. One thing that gets under my skin is 5 year graphs. Every Broker, Adviser is showing graphs that have gone up over the last 5 years. Buyer beware, but it is misleading. Make it law that all graphs have to show 10-20 year patterns. And how may of those companies exist in that index? You have to have a good Fund Manager. Buy stocks in Monopolistic companies, because they destroy their competition with unfair tactics, and grease the Politicians the best. And buy them when the world is ending. This is somebody who does not understand the true nature of knowledge. Knowledge is empty, and empty not only in the Absolute sense, but in every other sense, to boot! But, it is the packaging and selling of these ideas which is of most importance to this ignoble process. It is profit that gives these temporary notions the legs to scamper into the marketplace, gathering up all the labor-value within its grasp, giving way only when its grand coach and magnificent steeds are returned to their former state as pumpkin and mice [as the ideas have shown their true nature…emptiness]. Profit is what happens when animals develop an intellect, socialize within the context of such, and believe that the purpose of life is something beyond the fundamentals of individual survival. Profit [whose goal is obtaining more than one needs to survive] is the underlying motivation in obtaining something for nothing, the plague that will simply not allow mankind to move on in any significant way. True enough but ‘plague’ can and has been conquered before. After all what doesn’t kill you only makes you stronger. If we understand that ‘profit’ can be useful but as an efficiency indicator, not as a goal in itself, we’ll be able to leave this ‘plague’ behind. I agree completely with this analysis only the intellectuals described above are terminally ill with, as you aptly described, ‘instrumentalism’. They don’t think because of an irrepressible urge to know and don’t communicate because they want to share/verify their findings. They ‘think’ because they want to discover something to impress their audience with and they publish because they want to achieve ‘tenure’. As you might observe, Nature has provided The Ultimate efficiency indicator, survival. Because the intellect [and proportional to increasing complexity] diverts people further and further from the Truth, I would suggest that we might want to observe the survival skills of the Redwoods or your friendly neighborhood cockroaches, as they seem to have the skill sets we desperately need. I believe I am going to make a suggestion to President Obamarama that he consider e x p a n d i n g the government just a tiny bit more to include experts from the ant world to assist the Department of Housing and Urban Development, leaches from the South American Amazon region to give advice on constraining the costs of health care, and a cockroach or two just to show the academic community that simple still works pretty darn well, even after 600M years! Being profitable might mean a well chosen survival strategy (efficient use of available resources, over the long term) or gluttony – Midas was granted his wish, to turn into gold everything he touched, but quickly died of hunger. And no, I don’t think that expanding government may solve anything. Government should do nothing but provide a safe environment for the people to do their thing, to ‘survive’ at the best of their abilities. The Government should only ‘police’, not impose policies. These “experts” gave Ukraine the Holodomor. A famine caused by bureaucracy and an insatiable desire by Stalin to grow wheat to sell for other commodities. Experts took over from generations of local experience on local land plots of 5 acres or less. Growing wheat where Sunflowers thrive is insanity. Plantings outside of custom (Moon phase etc) IS lunacy. For this reason we are bound to fail in the markets, because a few “Super Computers” are making the decisions now. Not an army of analysts and traders. Just a FYI, there are traders who still trade ‘manually’ and by manually, I mean, click-trading that are still profitable. Options/FX/Futures and some equities but I largely agree with this article, it’s hard to get an edge and keep it. Given the recent closures of HFT shops, profitability there isn’t as great as it used to be either.